"Magnetic resonance imaging (MRI) is a noninvasive medical test that helps physicians diagnose and treat medical conditions. MRI uses a powerful magnetic field, radio frequency pulses and a computer to produce detailed pictures of organs, soft tissues, bone and virtually all other internal body structures. The images can then be examined on a computer monitor, transmitted electronically, printed or copied to a CD. 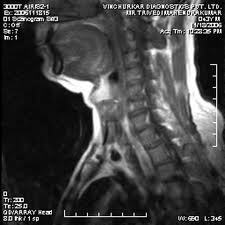 MRI does not use ionizing radiation (x-rays)." "Detailed MR images allow physicians to better evaluate various parts of the body and determine the presence of certain diseases that may not be assessed adequately with other imaging methods such as x-ray, ultrasound or computed tomography (also called CT, MDCT or CAT scanning). 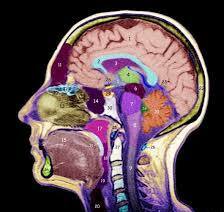 Currently, MRI is the most sensitive imaging test of the head (particularly in the brain) in routine clinical practice." "High-quality images are assured only if you are able to remain perfectly still or hold your breath, if requested to do so, while the images are being recorded." "If you are anxious, confused or in severe pain, you may find it difficult to lie still during imaging. 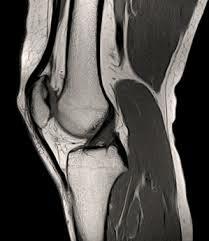 A person who is very large may not fit into the opening of a conventional MRI machine. 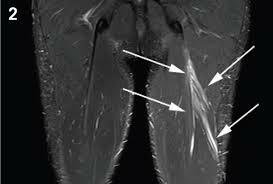 The presence of an implant or other metallic object sometimes makes it difficult to obtain clear images." "Detailed MR images allow physicians to better evaluate various parts of the body and determine the presence of certain diseases that may not be assessed adequately with other imaging methods such as x-ray, ultrasound orcomputed tomography (also called CT, MDCT or CAT scanning)." "High-quality images are assured only if you are able to remain perfectly still or hold your breath, if requested to do so, while the images are being recorded. If you are anxious, confused or in severe pain, you may find it difficult to lie still during imaging. 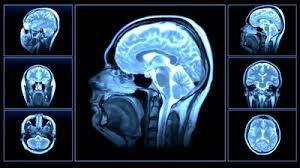 A person who is very large may not fit into the opening of a conventional MRI machine. The presence of an implant or other metallic object sometimes makes it difficult to obtain clear images." "Patient movement can have the same effect. 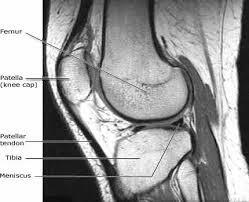 MRI generally is not recommended for patients who have been acutely injured; however, this is a clinical judgment. This is because traction devices and many types of life support equipment must be kept away from the area to be imaged." 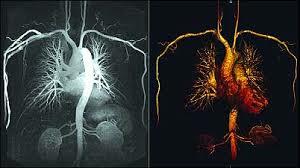 "Angiography is a medical test that helps physicians diagnose and treat medical conditions related to blood vessels. Angiography can be performed with one of three imaging technologies and, in some cases, a contrast material is administered to produce pictures of major blood vessels throughout the body." "Angiography is performed using: X-rays with catheters placed into the blood vessels of the body,Computed tomography (CT), Magnetic resonance imaging (MRI)." "Unlike CT angiography, MR angiography is not able to see and capture images of calcium deposits. 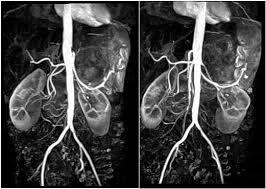 The clarity of MR angiography images of some arteries does not match those obtained with conventional catheter-based angiography. MRA evaluation of small vessels, in particular, may be difficult. 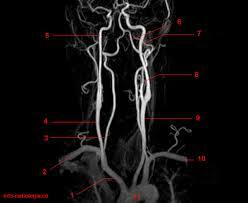 Sometimes it may be difficult to create separate images of arteries and veins with MR angiography." " Magnetic resonance imaging (MRI) is a noninvasive medical test that helps physicians diagnose and treat medical conditions. MRI uses a powerful magnetic field, radio frequency pulses and a computer to produce detailed pictures of organs, soft tissues, bone and virtually all other internal body structures. The images can then be examined on a computer monitor, transmitted electronically, printed or copied to a CD. 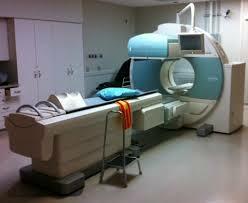 MRI does not use ionizing radiation (x-rays). " "Detailed MR images allow physicians to better evaluate various parts of the body and determine the presence of certain diseases that may not be assessed adequately with other imaging methods such as x-ray, ultrasound or computed tomography (also called CT, MDCT or CAT scanning)." "High-quality images are assured only if you are able to remain perfectly still or hold your breath, if requested to do so, while the images are being recorded. 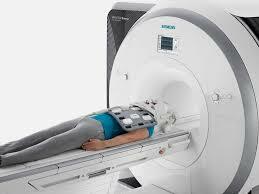 If you are anxious, confused or in severe pain, you may find it difficult to lie still during imaging. " 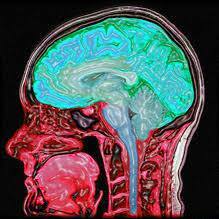 "A person who is very large may not fit into the opening of a conventional MRI machine. The presence of an implant or other metallic object sometimes makes it difficult to obtain clear images. Patient movement can have the same effect. "